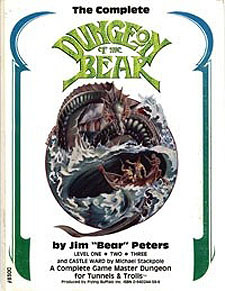 The oldest dungeon designed for Tunnels & Trolls anywhere, The Complete Dungeon of the Bear is now available for use by any T&T Game Master. Previously published in three separate booklets, this one book contains all the tradtions, traps, tricks and monsters found in the original, Plus Michael Stackpole's Castle Wars, the entrance to the Dungeon of the Bear. The complex becomes increasingly dangerous the deeper it is delved, and characters of some experience should be able to find their own level of challenge within. This is a Game Master's scenario adventure for Tunnels & Trolls. You will need the Tunnels & Trolls rules, paper, pencils, some six-sided dice, and a few friends to play this game.